The rebuilding Chicago White Sox are reportedly close to locking up one of their core pieces long-term before he even plays a big league game. According to multiple reports, the White Sox and top outfield prospect Eloy Jimenez are finalizing a long-term contract. It is said to be a six-year contract worth $43 million guaranteed, with two club options. The team has not yet confirmed the deal. Players with less than one full year of service time have signed extensions in the six-year, $25 million range with multiple club options in recent years. The Rays gave super utility man Brandon Lowe six years and $24 million on Wednesday, for example. Jimenez, 22, is raising the salary bar for players with 0-1 years of service time considerably. Once the deal is finalized, Jimenez will become the third player in history to sign a long-term contract before making his major league debut. The Astros gave first baseman Jon Singleton five years and $10 million in 2014 and that deal didn't work out at all for Houston. Singleton never solved MLB pitching. 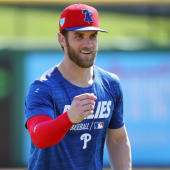 Last spring the Phillies gave infielder Scott Kingery six years and $24 million, and he posted a .267 on-base percentage as a rookie. Jimenez has some of the best raw power in baseball, which he generates with electric bat speed plus the strength and leverage in his 6-foot-4 frame. His pop has elicited comparisons to Giancarlo Stanton, but he's a better hitter than Stanton. He excels at recognizing pitches and making adjustments, allowing him to repeatedly barrel the ball with high exit velocities to all fields. While his offensive prowess could make him a superstar, Jimenez won't provide a lot of value outside the batter's box. He has slowed down as he has matured physically and is now a below-average runner. The ChiSox optioned Jimenez to minor league camp earlier this spring after he hit .154/.154/.346 in 26 Cactus League plate appearances. He later admitted he put too much pressure on himself to impress and make the team. Assuming this contract extension is finalized, Jimenez is likely to find himself on the team's Opening Day roster rather than down in Triple-A. The White Sox were obviously going to keep him in the minors the requisite 16 days to push his free agency back one year. There's no need to manipulate his clock once the extension is in place though. Service time becomes irrelevant. You can see a contending lineup beginning to take shape. Granted, Jimenez is unproven at the MLB level and both Moncada and Anderson are spinning their wheels a bit, but they are not short on talent or athleticism. There is young star-caliber talent in that lineup and that's exciting. For reference, the very good but also inconsistent Marcell Ozuna will bank $26.4 million during the same six-year chunk of his career covered by Jimenez's contract. Perennial 40-homer guy Khris Davis will make $34.1 million during that six-year span. The White Sox are betting big on Eloy. If he becomes the player everyone expects, the contract will be a steal. That said, if he falls short of expectations, it won't be albatross either. Jimenez came over from the Cubs in the Jose Quintana trade two years ago and he received a $2.8 million bonus as an amateur. Even then, turning down $43 million guaranteed before playing an MLB game would've been tough. Eloy's locked in a life-changing payday and, even if the two club options are exercised, he'll still enter free agency in his prime and be able to cash in big. The Jimenez extension could serve as a template for the Blue Jays and top prospect Vladimir Guerrero Jr., should the two sides have interest in a long-term deal. Vlad Jr. is the game's best prospect and he's widely considered a generational type hitter. He won't be on the Opening Day roster due to an oblique injury, though a long-term deal would give Toronto cost certainly over his arbitration years and some free agent seasons. Last season, Jimenez posted a .337/.384/.577 batting line with 28 doubles and 22 home runs in 108 games at Double-A and Triple-A. That is monster production for a player his age at those levels. In a world without service time, Jimenez almost certainly would've been in the big leagues at some point in the second half last year. Spring training is always a busy time for contract extensions. In recent weeks Nolan Arenado, Alex Bregman, Max Kepler, Aaron Nola, Jorge Polanco, Luis Severino, and others signed multiyear contracts that cover free agent seasons.